Happy New Year! I hope youand your family have a wonderful 2009. Looking back over 2008, I amgrateful once again to have been able to train with so many Buyῡ from around the world. Domo Arigato! For our Buyῡ traininggroup, this summer markedthe eleventh anniversary of BuyῡCamp West in San Francisco under the Golden Gate Bridge on the Pacific Ocean, aswell as, a fifth Buyῡ Camp East in New Jersey. Click the respective links to see some photos. Buyῡ Camps are a great way to connect with old friends and get that "continuing education" and inspiration that will help you "keep going" when you get back to your own, local training group. See you in San Fran and/or NJ again in 2009! 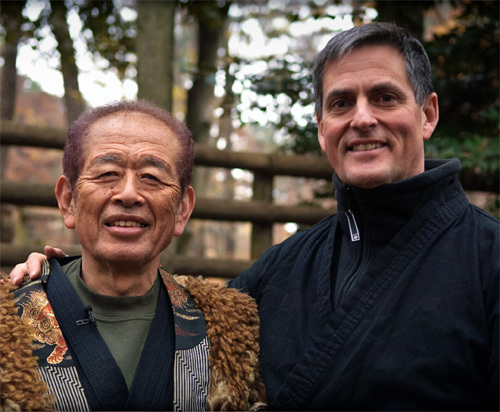 I was in Japan for the Daikomyosai – Hatsumi Sensei's annual 3-day training event. It was an extra special training experience outside in Shimizu Koen (Park). It was wonderful to train outside among the beautiful turning leaves of the Japanese maples. We worked on the basics of our art; and it was a marvel to watch Hatsumi Sensei – at age 77, mind you! – rolling around on the ground, poking people with sticks, and bouncing heads off of trees. Our art is definitely made for the outdoors. When I was a younger man, recently released from active duty in the Marines, I spent a fair amount of time in Shimizu Koen. In those days there usually weren't any other foreigners in Noda. It was a little lonely sometimes; but I had a routine. My day started out every morning (and I mean EVERY morning) with a breakfast of saba (an oily breakfast fish), rice and miso soup with the three ladies in my life: Oba-san (grandmother), Oka-san (mother), and daughter Mitsuke at the ryokan where I lived. After that I would read, write, and review my notes for a couple of hours. Then it was off to lunch at the one place I knew where I could get karaage (fried chicken) and a salad—something that remotely reminded me of food from home. In the afternoon I would go visit Hatsumi Sensei, helping him with this or that, or just taking advantage of an excuse to be around him. On the days that Sensei was busy or had patients, I would go down to the Edo river and follow it to Shimizu Koen, just walking around and practicing my movement skills. I had a sempai named Muramatsu who was drilling me in the kihon basics of our art, as well as, ninja walking, leaping and stealth movement. They say that the most important part of martial arts training is the training you do by yourself. I did a lot of it at Shimizu Koen. In the evening there was usually training some place – Noguchi Sensei's or Ishizuka Sensei's dojo in Kashiwa (nicknamed "Samui Dojo" because it was unheated in the winter; it also had an outhouse that was an experience any time of the year). Sometimes we went to the local jinja shrine to train or take pictures. The scariest place to train for me was the dojo of a man some of us met for the first time at the Daikomyosai in Shimizu Koen. The Vice President of the park is Mr. Kobayashi, who was introduced near the end of the training. 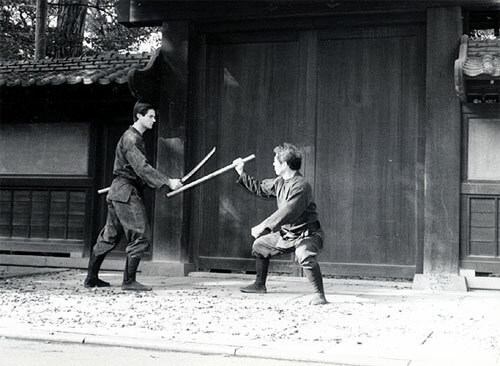 Although it does not appear that he actively trains anymore, he was one of Hatsumi Sensei's first students many years ago, and one of the few who actually met Takamatsu Sensei. He spoke movingly about meeting his teacher's teacher and how awed he was by him. Kobayashi san came across as a very nice, modest gentleman. Let me tell you, though, 25 years ago he came across a little differently, as an accomplished – and serious – martial artist. And tough! It was great to see him, but he still makes me a little nervous! I have been at virtually every Daikomyosai since Yuma Mura in 1983, and I don't know how many more times we will all get to meet at a Daikomyosai in the future, but 2008 in Shimizu Koen will stand out as an especially wonderful experience. 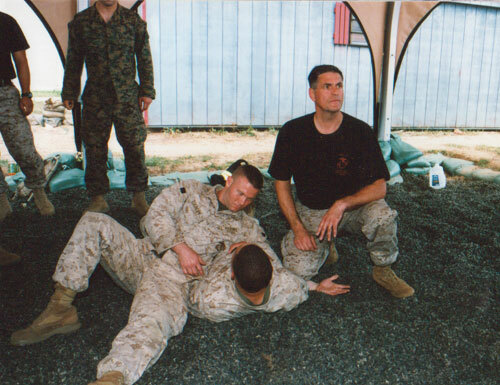 Some of the mostmotivating training I did,again in 2008, waswith the Marine Corps Martial Arts Program (MCMAP)in Quantico, Virginia. This fine program, led ably by my friend Joe Shusko (LtCol USMC ret.) 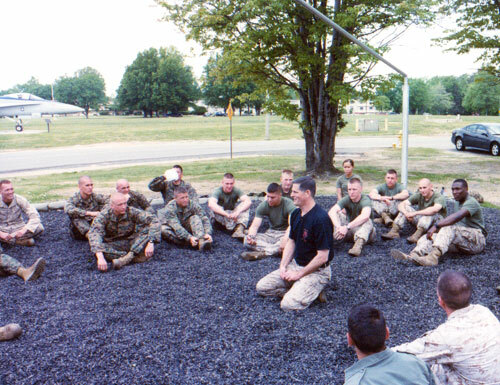 covers thearmed and unarmed martial arts techniques and combat conditioning that a Marineneeds to walk the warrior path – both in combat and in daily life. Joe's efforts to develop Ethical Marine Warriors through MCMAP makes him one of the unsung heroes of our nation. Developing Ethical Warriors is a synergistic process that clarifies, activates and sustains Warrior Ethics. Clarify means: What is the Warrior Ethic? Activate means: How do I get the feeling of it, deep in my conscience, deep in my “guts?” Sustain means: Once I get the feeling, how do I keep it from “wearing off,” especially under the stress of combat, but also through the challenges of everyday life? The foundation of the Warrior Ethic is our 1776 value “all men are created equal,” which is an acknowledgement that there is a “Life Value” that is a universal value shared by all people. Actually, as Bob Humphrey pointed out, it is a dual value – self & others. The Dual Life Value – and its corollary, human equality – is the basic premise of the Warrior Ethic. The great moral values, such as truth, freedom, charity, honor, courage, commitment, etc. have one thing in common – when they are functioning correctly, they are all life-protecting. But they are still relative values. Our relative moral values must be constantly examined to ensure that they are always performing their life-protecting mission. For example, courage can become foolish martyrdom; commitment can become irrational fanaticism; honor can become self-righteousness, conceit, and disrespect for others. As relative moral values they must always remain grounded in the Life Value. Ethics are moral values in action. It starts in the school yard. Most everybody knows that the bully is wrong – that's morality. But only a few will speak up to protect the one getting bullied by calling for a teacher – that's ethical behavior. Even fewer will step in physically to actually protect the child being bullied – that’s the behavior of an Ethical Warrior. Ethics are moral-physical. Moral people may want to step up and do the right thing, but they often lack the physical courage and ability. Martial arts gives them the necessary skills and confidence. And that is why Ethical Warrior training includes – and must include – martial arts. Warriors protect life, even at risk of their own. And they kill only if necessary to protect life. Respect for the Dual Life Value sets them apart from those who may appear "moral" within the context of their own environment or culture, but who do not respect the lives of others outside their own "in" group. "Saving the world is like mowing your lawn; you have to do it about once a week." Sustainment is just a fancy word for consistency in your moral-physical training regimen. That is what "keep going" really means, Ithink. It means "keep training." Keep training, even whenthere just seems no way to make the time, even when you have a really goodexcuse to stop or "take a break." Never stop, even when yourlife becomes complicated or difficult (and it always does, for all of us). KEEP TRAINING ANYWAY! Why is this so very important? The obvious answer is, that you just never know when you might need your physical skills. It could be never; it could be in 5 minutes. As a warrior, we are pledged to protect the life of self and others. We have the responsibility to stay sharp and physically ready. But it is more than that. We are talking about the possibility of violence between human beings. The danger is more than physical; it is also psychological or spiritual. Forget the fantasies. There is sufficient evidence that real violence and killing is so abhorrent to normal humans that it is inherently damaging to virtually everyone who participates.Even if you "win," or even if it is "justified," exposure toviolence and/or killing is a life-altering event for most of us. In fact, it could be said that it would be unnatural if people DIDN'T get some degree of PTSD (post-traumatic stress disorder) from exposure to violence. That is why, I believe, that the escaping or hidingnature of Ninpo is so important – it teaches that avoidance protects ourbodies and our spirits. But, it is not always possible to avoid violence. Therefore, a physical-moral training regimen can inoculate the warrior from the stress of combat and mediate the effects of PTSD afterward. Hatsumi Sensei's unique training methodology has shown us the way. Professor Humphrey's Warrior Creed speaks to the ethic. Warriors do twothings: they fight in wars; and when they are not fighting, they train. That's it. Everything else wraps around it. Hatsumi Sensei is stilltraining at 77. Professor Humphrey fought on IwoJima, then trained consistently untilthe end of his life. He knew what he was talking about. If you areinterested in experiencing more of Robert L. Humphrey's Life Values teachings, we'll see you at the "Ethical Warrior" seminar next July in New Jersey. And please consult the WIN seminar page periodically for detailsof all of our workshops. People tend to struggle to reach some goal and think that life is fulfilled only whenthat goal is fulfilled. People don't appreciate their day to day life becausethey are too busy chasing whatever they think they should be. That is against"shiki" because it is an obsession of thought. Interesting...shikiis usually used with other words nowadays to add the meaning of"knowing," "understanding," "acknowledging," and soforth. But I believe Sensei is referring to the "shiki"which is more like an all-encompassing sense: Sense of seeing, hearing, smelling, tasting,touching, etc. It is like the counterpoint to the concept of the void, or kuu –like an awareness of everything in every way. What we "think"is incomplete, therefore, and may be no more than an illusion. We must integrateall of our senses – and more. When we can do this, it is said, then we can glimpse the beginning of enlightenment. As always, Ihesitate to say I "know" what Sensei is really saying until thelessons reveal themselves over the course of the training year. The best way to keepup with what Hatsumi is saying about training in 2009 is to go to Japan, ofcourse. But, between trips, I highly recommend Doug Wilson's blog. It appears that Hatsumi Sensei has already started to elaborate on someimportant concepts as they pertain to our training; check out Doug's blog hereto read more. There is also a lot of good information on Joji Ohashi'ssite here. Each year I alsolike to introduce a complimentary "Buyῡ theme" of our own. Thisyear, the theme is "integration." We will start off the yearwith exercises that will help us better integrate the movements of our bodies, andthen move on to integration of our warrior training with the world outside thetraining hall. As I said above, warriors fight in wars, and when they are not fighting, they train. Most of us are too lucky or old (I am both!) to fight in a war. That meansthat there is nothing left but the training. Keep training and approachall of your life from the perspective of the Ethical Warrior. Sure, wehave jobs and families, etc., but bless your luck if you have not been called tofight – right now those folks are far from home, and have left their jobs andfamilies behind. Pray for them and keep training in 2009. Thank you, Buyῡ, forhelping me to keep training this year!